7 Week, 6 Day/Week Training Plan designed for tactical and other high impact athletes ages 45-55 years old. Plan concurrently trains gym-based heavy strength, chassis integrity, endurance, work capacity and chassis integrity. “SF45” is an acronym for “Strength and Fitness 45” and this programming is designed for older tactical and other high impact athletes in the 45-55 age range. 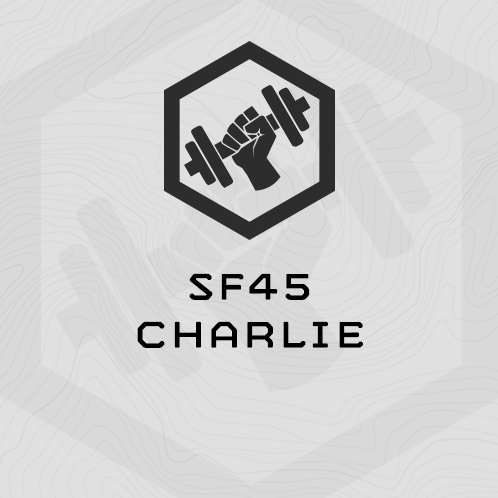 SF45 Charlie is the third of a series of 4 training plans in this collection – Alpha and Bravo and Delta are the the other 3 plans in this series.All four plans can be purchased together in a packet, HERE. SF45 Charlie is a 7-week, 6 day/week balanced training plan. Week 7 in the plan is an unload/re-assessment week. This is the first version of this plan, published June 2017. Heavy, Low Volume Strength – think heavy barbel and 1-4 reps per set. The goal is to increase or maintain relative strength (strength per bodyweight) in the most efficient manner possible. Some SF45 cycles will feature bodyweight strength training, but none will include moderately loaded free weight strength training in the 5-12 reps per set range. This is to avoid unnecessary joint impact. Endurance – Recreationally, most activities for athletes in this age range are outside and have a strong endurance component – biking, hunting, trail running, hiking, alpine climbing, etc. As well, for experienced athletes who’ve spent decades throwing iron around in gyms, the appeal of training inside wanes. Endurance programming includes assessment based intervals at a threshold pace, long distance intervals at an easy pace, and gym-based endurance training. This programming may include rucking and ruck running, as well as loaded step ups. Specific to this plan, SF45 Bravo, the athlete will be able to chose between running and biking. Chassis Integrity – MTI’s mid-section training methodology aims at building transferable mid-section strength and strength endurance. Four movements are emphasized: Rotation, Anti-Rotation, Total Body and Extension. Chassis Integrity can be trained in focused circuits, as well as in complementary gym-based endurance events. Non-high Impact Work Capacity – In this age group, gone are the days of hard, intense, high impact multi-modal gym-based work capacity programming. For day to day training, the interest and need for this type of fitness is not worth the joint impact. Work capacity training is limited to lower impact gym exercises and shuttle sprints. Deep Squat Avoidance – For our over-40 lab rats, it’s nearly impossible to do heavy back or front squats without limited joint pain. Lower body strength training in these cycles will focus on lunges, hinge lifts and bodyweight or lightly loaded complexes. Experienced tactical and other high-impact athletes age 45-55. This plan includes olympic and functional fitness exercises and knowing your way around a weight room will easy your learning curve for the programming. 60-120 Minutes. Gym work is designed to take 60-70 minutes. Saturday’s long run may extend to 120 minutes. We use this term to describe the pace for your Chassis Integrity circuit and gym-based endurance efforts. Work through these efforts steadily, not frantically. Effort is moderate, not threshold. • Stop watch with countdown interval timer. Ideally, you will train 6 days in a row, and take 1 full days off for rest. If for some reason miss a session, do not skip ahead. Start again where you left off and complete the sessions in order throughout the plan. 20x Step Ups @ 20"